Singing icon announces her Vegas comeback after taking time off to care for her husband, Rene Angelil. The singer Celine Dion changed the face of Las Vegas when she started performing there and she made headlines when she left it all behind to take care of her ailing husband. Tonight she's making headlines yet again with a comeback and a raw, emotional interview with ABC's Deborah Roberts. You haven't walked out here for months? Many, many months? Many months. Reporter: It's been a year since Celine Dion last performed on this Las Vegas stage, built specially for her. To belt out those iconic songs like "My heart will go on." ? My heart will go on and on ? Reporter: For much of the past year, she's been silent. Dealing privately with the kind of news all families dread. Her husband of 20 years, Rene, diagnosed with throat cancer in 2013, again. It was December 17th and I will never forget. Because it was a wedding anniversary and I was rehearsing for the boys. After the rehearsal I went back in my dressing room and I saw him looking pretty devastated and shocked. And I was like, what's going on? And he said, I have cancer again, the doctor just called me and I have cancer again. And at that moment, honestly, my heart started to beat faster. But my body shut off. And I was like, I'm going to go put wakeup. I'm going to go sing incredible. I'm going to forget how I feel right now. ? Incredible ? And I went on. I sang the song. ? We were incredible ? And then we went to the hotel. And then reality started to strike. It took a toll on me. Reporter: Celine and Rene met when they were 12. He became her manager, her mentor, and later the love of her life, helping turn those early ballads into gold. ? Because I'm your lady ? Reporter: The devastating diagnosis made her residency in Vegas a struggle. Celine exhausted, torn between her passions, the stage and her husband. I had to leave him behind. He wanted me to start the shows again. How do you do that? Sometimes -- I think I'm used to it -- don't feel what you need to feel. Just do it. Go onstage. I did. Because you're a showbiz veteran, you know -- No, because I love him. And I did. And -- it was very hard. Reporter: It was a grueling time. Rene going through painful treatment, Celine comforting their children, R.C. Now 14, and the twins Eddie and Nelson. What about our kids? What happens to papa? He can't hear very well because of the radiation so his hearing is not really well. He can't use his mouth. He can't eat. So I feed him. He's got a feeding tube. I have to feed him two times a day. You did so much of this yourself. I do this myself. And so I feed my husband. And I feed my kids. And unfortunately, I had to say, listen. I can't be half here and half this. Meals allow me to stay home. Reporter: She was leaving behind an unprecedented multi-million dollar deal at seize sar's palace. Thank you so much. Reporter: To step away and focus on what mattered most to her, her family. What kind of a toll has it taken on you? On the marriage? I stopped, we healed, we focused, we live a day at a time. Nobody knows what the future is holding for us. How did you explain it all to the children? What did you say to them about daddy? I really believe that children know it all without asking so much. And I also believe that us parents, adults, we try to put a stop to what we are afraid of explaining because we're scared. Because we're worried. If you tell the kids, like I said to my children, you want to come and help me feed papa today? I'm not making a deal out of the feeding tube. You want to help me out? You're a good feeder, thank you so much, come on, give a kiss to papa. I have a lot of empathy for my teenager, R.C., Rene Charles. He doesn't really talk about it. But I'm sure it's hard. I'm sure it is. Reporter: In many ways, Celine Dion is like so many of us, struggling, vulnerable at times. But growing stronger through suffering. Millions of people in the world, they go through this drama. And a lot of them don't even say good-bye. You know what? I'm amazed how fortunate we are. I think the fact that I've had this open-book type of personality and share it all, it's me. It's the person I am. I think it helped me in my life to sing my songs better. Reporter: Now she's see those powerful lyrics again with a new understanding of love and devotion. Celine announcing she's taking the stage once again starting August 27th. And this is where I'll stand. Right here. A lot of competition out there now. Mariah Carey is coming to town, Britney spears has been here. Does that make you any more nervous? I think it's going to help all of us to be the best of ourselves. There's one Mariah, there was one Whitney, there's one Britney. There's one of us. You know, I don't believe that humans are all the same. Reporter: But while other stars may travel back and forth to Vegas, Celine has set up roots here. It is our primary home and it's wonderful to be here. My teenager plays lots of golf. Now the arenas. He's a hockey player. Believe it or not. Wow. We were looking for ice in the desert. It was quite, quite hard to find. Not so much. What are you looking for? You can find it here. Reporter: Though ailing, Rene remains at his wife's side and couldn't resist joining us onstage. So when you walk out here in August, where will Rene be? I don't want you to be the first -- I'm not going to be able to say. You clearly love him a lot. You both adore each other. We do. We complete each other. We're one. Reporter: They're in this together. Their love and the show will go on. For "Nightline" in New York, I'm Deborah Roberts. ? My heart will go on and on ? And a question of all of Celine's songs, which speaks to you the most? Tell bus your pick on our "Nightline" Facebook page. 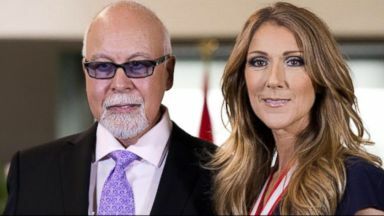 The singer canceled a planned tour of Asia as her husband, Rene Angelil, battles throat cancer. The singer opens up in an interview with ABC News about her difficult struggle to help her husband battle cancer. The legendary singer shares details of her family's battle with cancer.